Today was the second day of what I have been calling “Our Drive Across America” even though really we are only going about halfway across. I was thinking it might feel like a drive across America by the time we were done, but so far it’s been a lot of fun. We are leisurely travelers. 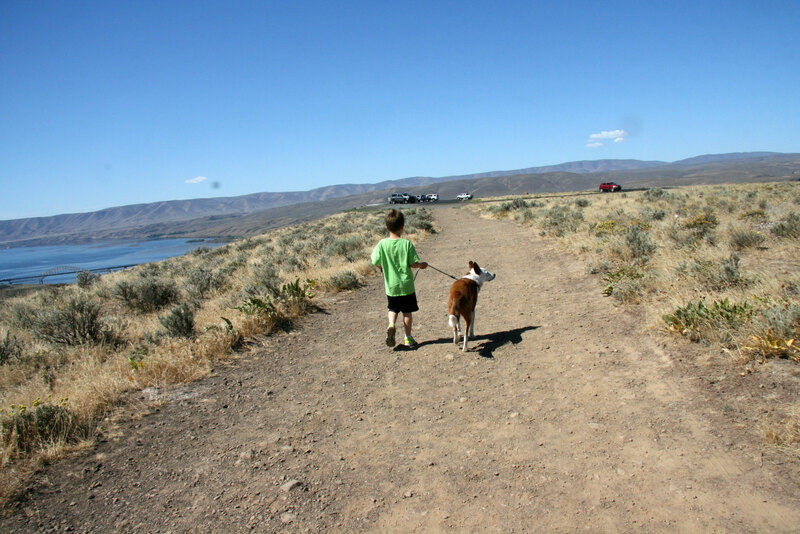 For example, we made our first stop in Vantage, Washington. It’s about 30 minutes from our house. 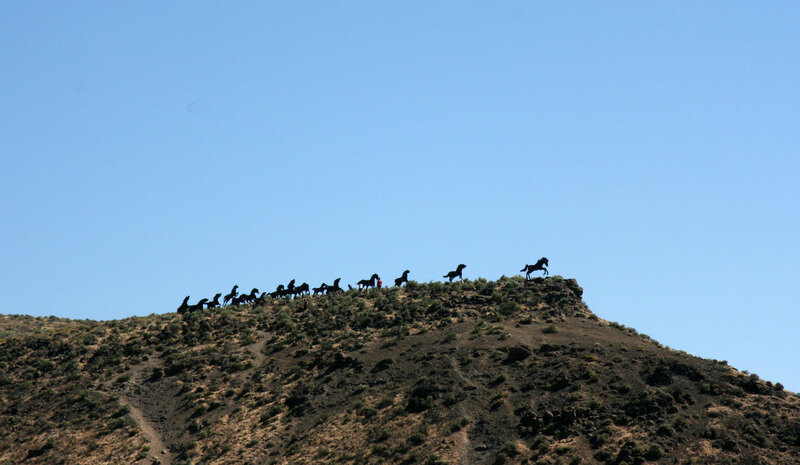 I’d been wanting to stop at the scenic overlook to see the Wild Horses Monument though. So we did. It’s just beautiful. 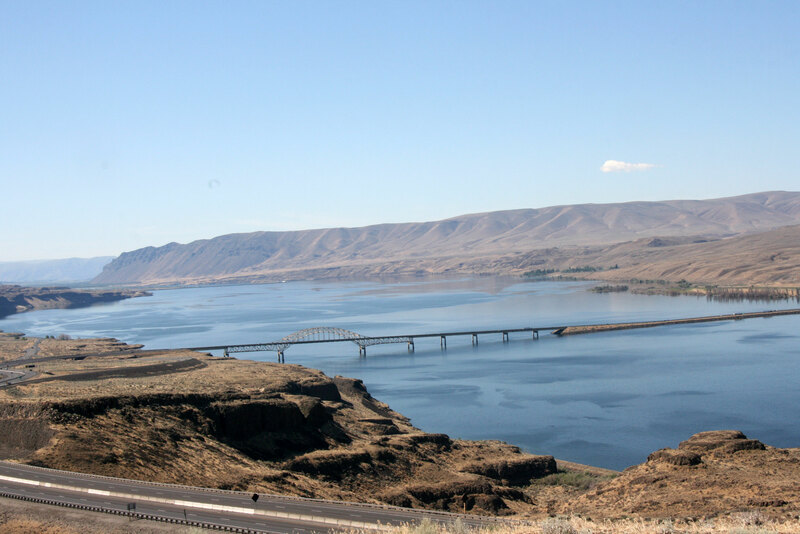 This scenic stop also overlooks the Columbia River. I love the Columbia River. We took the opportunity to take Buster for a little stroll too since we’d stopped. We drove across eastern Washington on I-90 to Spokane. We had not made this drive before. It’s pretty flat and desolate, but it was fun because I kept seeing these! 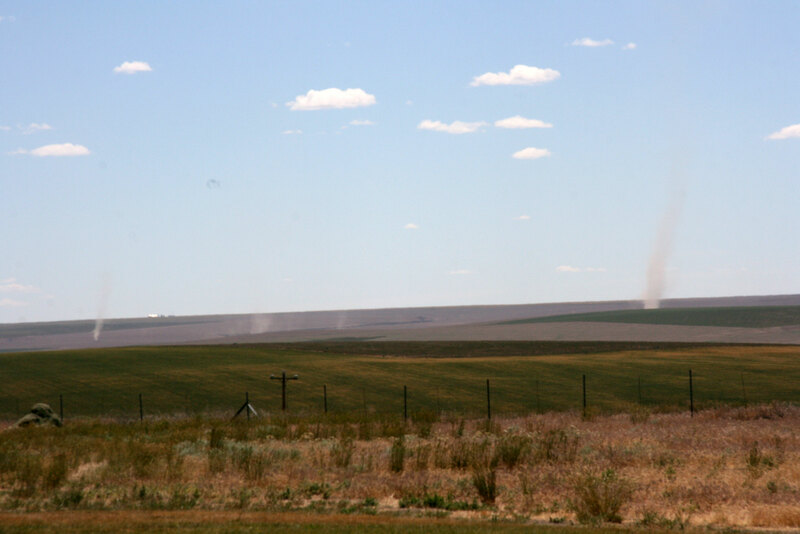 Dust devils everywhere in the fields! We have driven through a lot of areas similar to this in other parts of the country, but I’d never seen so many dust devils. 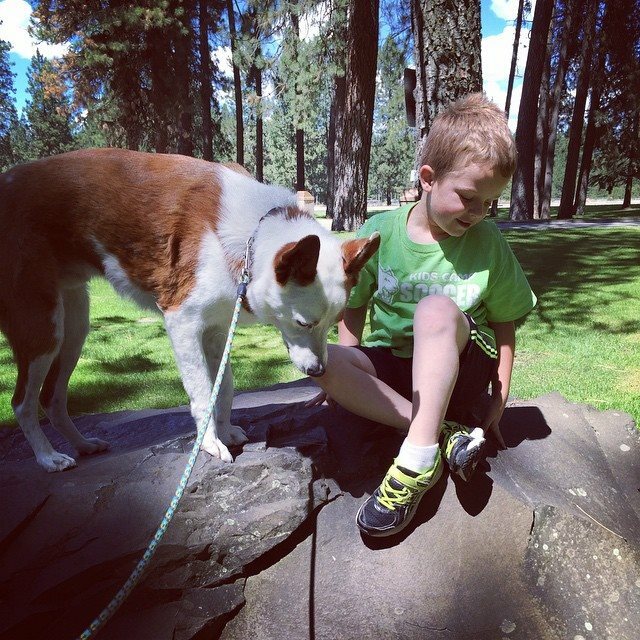 We stopped at a rest area outside of Spokane before we went into Idaho. 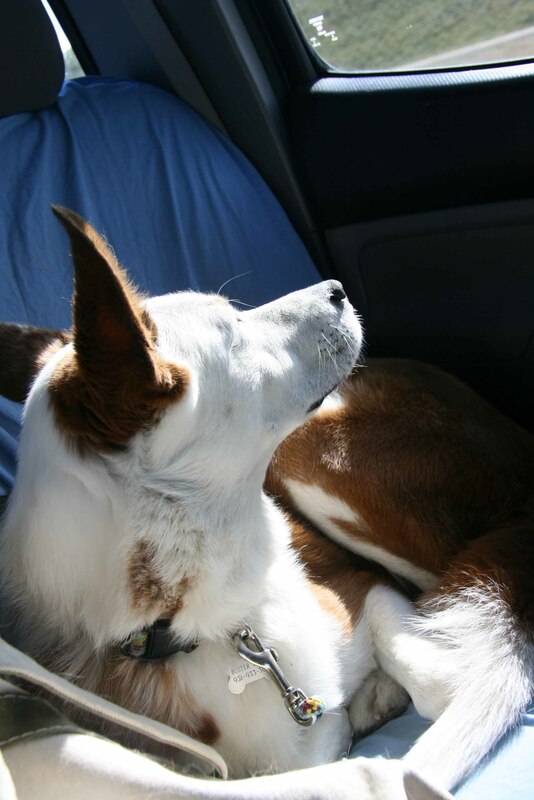 We like to stop at rest areas, and there are a lot of beautiful ones in Washington, Idaho, and Montana. The facilities were almost all spotless. Some even have fenced in areas for dogs to run leash free. I didn’t take any pictures, but our drive across I-90 through part of the Idaho panhandle was amazing. We drove by Couer d’Alene Lake, and it’s just incredible. It’s a beautiful mountain lake, and we can’t wait to go back there some day. 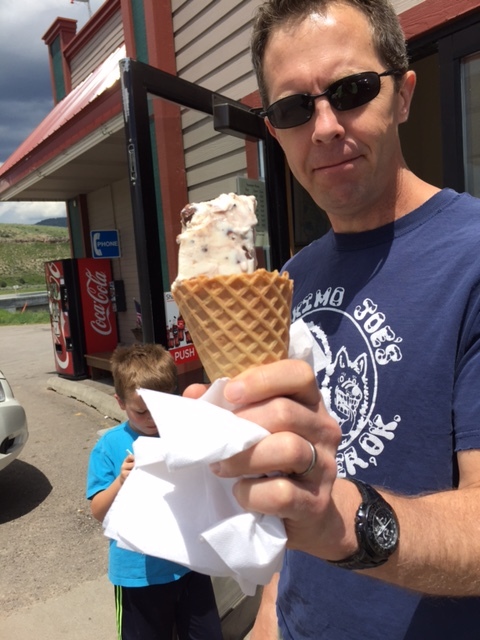 We spent the night last night in Butte, Montana. We left pretty early this morning and headed to Rock Springs, Wyoming which is where we are tonight. We drove through some beautiful country today. For the past two days we listened to the entire first Harry Potter book on cd. Jim Dale reads it and he is an amazing reader. Davey wanted to listen practically all day long both days. Jim Dale is so entertaining to listen to, and the story is so good that I think we could happily listen to it again. We might! Today we also drove through Spencer, Idaho. 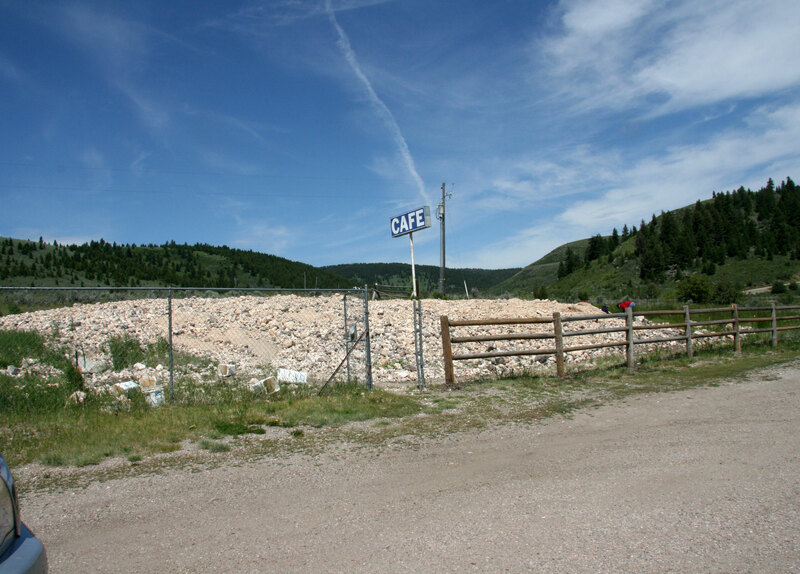 There are opal mines there, and you can pay to dig for opals. I don’t know if they brought this rock in or if this is the mine? There were some people digging here though. I thought this was interesting! Tonight we experienced a nice noisy thunderstorm, and it poured down rain. Buster was not happy. Poor nervous dog. He hadn’t really experienced thunder much before. He’s been enjoying the trip for the most part though. He’s always just happy to be with us. Somehow David and I both accidentally wore Eskimo Joe’s t-shirts today. So when we checked in to the hotel tonight, we encountered a group of people who were traveling together on their Goldwing motorcycles. They were from Sand Springs, Oklahoma which is only about 20 minutes from where David and I grew up! Small world. The Eskimo Joe’s shirts almost always bring out fellow Oklahomans! Now it’s time for rest before we head out again tomorrow. This entry was posted in Explorations, Family, Uncategorized by cpeezers. Bookmark the permalink.